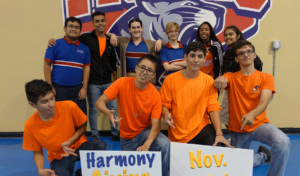 We are asking our Harmony community to consider providing greater assistance to our graduates through generous contributions to the Harmony College Fund on our first ever Giving day November 28th, 2017. All your donations will go towards helping our Harmony graduates to complete their higher education dreams and achieve their career aspirations by providing additional scholarships and career support services. Count Down to Harmony Giving Day! Harmony School of Excellence will be hosting our 1st Parent Academy, Saturday, December 2nd from 9:00 am- 3:30 pm. This Parent Academy is for you the parents to come and receive training in subjects like, STAAR prep, Kids Health, Financial Health, Literacy, and much more! It is our goal that this Parent Academy will empower our parents with the skills and resources they need to strengthen their children’s educational success. Click to view our Texas Education Agency 2017 Accountability Summary. Please click to view our 2015-2016 School Report Card.